E. How To Structure Private Money Deals to Get Lenders to Chase YOU! G. 6 Ways to Structure Private Money Deals! Joint Ventures for New Construction and Rehabs: a Powerful Strategy for both sides! K. BRRRR: Powerful, rapid way to build a large real estate portfolio! L. Commercial Rehab Purchase, Financing and Deal Structure Training! M. Private Money Deal Structuring Tip: Pay Private Lenders with Their Own Money! This is an hour-long all-content video on how to find private money lenders, with six different ways to structure your deals. Please share this video using the links below! Daniil, I have only use the software for wholesaing my deals. Now, I am moving into fix/flip. I will definitely be using the private money marketing of the software. Great job Daniil. Keep up the good work. Hi Diane. We prefer you order via the website at https://rehabvaluator.com/upgrade but if need be you can call our office at 804-445-2700. Thanks! THANK YOU, DANIIL FOR THIS PRESENTATION. I REALLY LEARNED A LOT FROM IT. YOU ARE REALLY RIGHT ABOUT THE CALIFORNIA MARKET. SO MANY PROPERTIES ON THE MARKET. YOUR TRAVELS ARE SOMETHING ALSO OF INTEREST. DO YOU DO BUSINESS ALONG THE WAY? HAVE ALSO WONDERED ABOUT YOUR WALL IN RENO. I USED TO LIVE THERE. BUSINESS MUST BE GOOD. Hi Carolyn. I typically only invest locally so when I travel it’s usually just for pleasure 🙂 The wall in Reno is up and running along with the rest of the facility last time I checked, though there were some major management shakeups and typical drama. Hope you’re doing well! yes I like this program. Just slow down and make sure you show your work you did not change interest when you said you would make payments at the end. The numbers do work. Hi David – I don’t JV with anyone right now. Have too much going on here locally that keeps me busy! If that ever changes will definitely let you know. Thanks! Daniil: you are fantastic with this software ,and highly credited to the realestate industry, i have a good idea for you,don’t go online just yet with this software,maybe you can talk with jerry norton and come up with a pricing software for all parts :plumbing electrical roofing nails carpeting everything you would find in home depot or lowes ,yes i know we refer to 40 dollars a square/ft. on the software but to squees down itemized numbers on the sq/ft to say 35per quare/ft. i haven’t searched any companys but there are companys out there with simular materials,i refer to you for your dynamic and professional skills and your teaching and presentation along with the clarity ,and as for your immigrant status ,you are a darn good american russian citizen, this is the goodwill of a person when they show the people a good thing at a small price and to enhance society a better way to go. Jerome – really appreciate your compliments! We probably won’t go online till next year and even then I’ll have a free version people can use. Always good to hear from you bud! Fantastic,but i urgently need money badly.? Daniil, very good presentation for beginners and a good brush up for veterans. Your software is simple and allows a lot of flexibility especially since you have added the new features. Look forward to more of your videos! Great illustrations. Can you recommend where I can find the deal at 50% discount? I will really appreciate for kind assistance. This looks like what we need to get our lenders excited. Just showing them a picture or a video no longer works as well as it did. In this economy people want to see hard numbers that they can make a decision on. It may help in training investors to break down the rehab costs that investors might forget about such as insurance,taxes,utilities, lawn care or snow removal. I would like to see case studies on how you get accurate rehab numbers. Your homes look great do you have an interior decorator on staff? It is sometimes easier to get the hard things done but making it all flow and knowing what and how to upgrade can literally make the sale. We have one house that we had rehabbed for an investor but it does not pop and impress so it just sits on the market. Keep up the good work. Looking for private money lenders, please. I am existing client of yours Rehab pro and Rental Valuator pro , I did not get any of the bonus that you are offering. This software is the best, I use both of them for any deal that come-by, Guys, buy it and use it, you will not be Disappointed. As you know I have been using RehabValuator as well as the RentalValuator software programs for a couple years now and cannot tell you how powerful they are in communicating transaction details to all of my Private Lenders / JV partners during that time. I would recommend either of these programs to Newbies and seasoned Investors alike. My question to you however is, What similarities or differences are there between Rehab Valuator and your Newest project, JV Valuator? Is there a need or benefit for purchasing both or would this be considered an upgrade? Hi Bill! Thanks for your compliments and glad you’ve found our software so useful! The new one – JV Valuator – is sort of a hybrid between my Rehab Valuator and Rental Valuator. 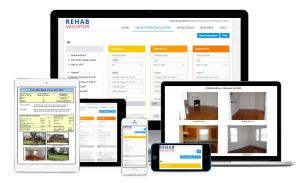 Rehab Valuator is specifically for short-term fix/flip or fix/refi/hold deals – deals with an exit strategy under 2 years. Rental Valuator is specifically for buy/hold deals, long-term deals 2-40 years. Especially commercial deals and apartments. JV Valuator was built specifically for deals where you buy the property with a JV partner, rehab it, and then hold it 2-10 years. It very specifically breaks down the financials and presentations for JV partners that go in on the deal with you. So it’s definitely a bit different from the other software programs. I try to create “niche” software programs for particular strategies, instead of making one bulky “one size fits all” software platform that would just confuse people. Hope that answers your questions/clarifies it. But if not, shoot me an email! Hey Daniil, Your software works well with freedom soft, another software program that I’m using to find cash buyers and comp’s in any US market. Thanks for your Eugenius program. Hi Willie – I believe that is covered in the video above! This was great. My partner and I are working on a deal now and the examples of money structuring will help us tremendously. Glad to hear it, Marilyn! Watched the video, which clearly offered the Premium software for a 1-time fee of $97. Clicked the link, was taken to order form for $197 for 1 year. The video was very informative, but the offer at the end really should match the price at checkout. Otherwise, you open yourself up to accusations of bait-and-switch, or worse. PS – On a more positive note, thanks for just focusing on the power of the software, and not throwing in a lot of vacation photos & other Jedi mind tricks that other purveyors of REI systems include in their promo videos. I apologize for that. Daniil does explain in the video that he is going to move to a subscription based model which is exactly what the $197/year is. It’s just a case of the video being a little bit older and to re-record it is very time intensive (he hasn’t had time to do that yet). I’ve made a recommendation that we at least put an FYI on the page explaining that it’s older pricing. Thanks for the heads up! You are rocking the House Man, with this software. Just keep doing what you do. Thanks >>> To the MAX ! do you have a video and / or software on finding cash buyers? Thanks for the tutorial but it would be purchased in a month later but I need more teaching from you I promise.